Written by: Rebecca Miller on October 22, 2018. The Doctor and her companions dive into the racially segregated South in this week’s episode. Still on the way back to Sheffield and the 21st century, the TARDIS lands them in 1955 Montgomery, Alabama. Not the most hospitable time and place for such a racially diverse group of companions. This isn’t the first time Doctor Who has touched on these themes. In the 10th Doctor’s run, Martha Jones ran into some of the same prejudices in Elizabethan England, and with the 12th Doctor, Bill Potts faced the same prejudices in Regency England. This episode makes these prejudices and the fight against them the whole focus of this episode. A focus that puts them directly in the center of the action, much like the 10th Doctor and Donna Noble found themselves in The Fires of Pompeii. Also in a place where they have to let history happen, despite how they feel about it. This week brings a new and potentially dangerous character in Krasko. Another time traveler, with not so benign intent with history. A traveler with a dark history in a place we have heard of before, the Stormcage, the universe’s most secure and dangerous prison and the former home of one River Song. Not one to just let someone meddle with history, the Doctor ends up head to head with this time traveler who looks a bit like an extra from Grease, just with far too much facial hair. For as much worry that Chibnall was going to ignore the Doctor’s past, there are so many little nods back to former Doctors. The new desktop on the TARDIS has a Visualizer much like the Time-Space Visualizer the 1st Doctor had. Also artron energy is mentioned again as something the TARDIS feeds on and is created by time/space manipulation, such as that by a Vortex Manipulator. Also the mention of the Stormcage. Lots of breadcrumbs thrown in for the long term viewers! Also lots of name dropping in this episode. And just why did the Doctor give Elvis a mobile phone that Sinatra ended up with? This episode does get a little heavy handed with the point, but managed to do it, without getting up on a soapbox or using the old Star Trek “Let me beat you about the head and neck with my point.” Ryan’s historical fanboying was very sweet and Graham’s angst at having to let history happen, had a very real feel to it. 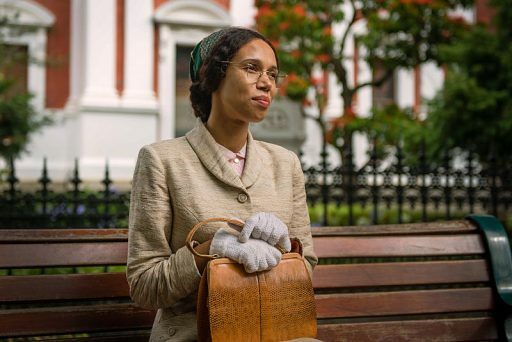 Rosa Parks herself, in just a few short scenes, gave a realistic and fleshed out feel to a woman, who is usually just a dry, historical name that is learned in social studies and Vinette Robinson does an amazing job of brining her to life. It could have been handled with a bit more finesse and we still don’t know Krasko‘s motive beyond some kind of far distant racism, which seems very out of step for the racial diverse future full of aliens. Also, where is the Time Agency? Isn’t this their kind of mess to clean up? There are far more questions than answers we are left with at the end of this episode. We’ll have to wait and see if they will tie this up or just leave it big blaring plot hole. Interesting writing note, Malorie Blackman, who wrote this episode with Chris Chibnall, is the first non-white writer to work on a script for televised Doctor Who. 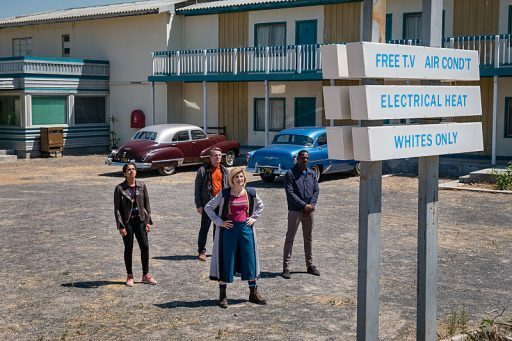 In a production note, both this episode and The Ghost Monument were filmed in South Africa, another country with a long history of segregation. Next week look interesting, back in Sheffield and down right creepy right in time for Halloween!